Is labor’s day over or is labor the only real answer for our time? National Book Critics Circle Award finalist and labor lawyer Thomas Geoghegan argues that even as organized labor seems to be crumbling, a revived—but different—labor movement is the only way to stabilize the economy and save the middle class. The inequality now reshaping the country goes beyond money and income: the places where we work have become ever more rigid hierarchies. A “perceptive, informed, and witty utopian thinker” (Michael Kazin, Bookforum), Geoghegan makes his argument for labor with stories, sometimes humorous but more often chilling, about the problems working people like his own clients—from cabdrivers to schoolteachers—face, increasingly powerless in our union-free economy. He explains why a new kind of labor movement (and not just more higher education) is the real program the Democrats should push. Written “in the disarming style of a self-deprecating lawyer in a beleaguered field” (Kim Phillips-Fein, The Atlantic), Only One Thing Can Save Us is vintage Geoghegan, bearing unparalleled insights into the real dynamics—and human experience—of working in America today. FirstOfTheMonth.org reviews Only One Thing Can Save Us. The Atlantic calls Thomas Geoghegan's Only One Thing Can Save Us, "a pragmatic, rather than a romantic, perspective" on the American labor movement. 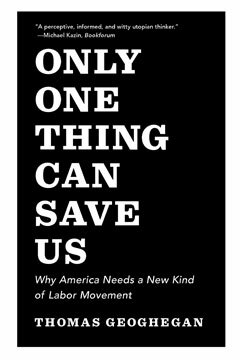 Jacobin calls Geoghegan "one of the most astute chroniclers of the labor movement’s excruciating decline" in their review of Only One Thing Can Save Us. The Sunday Book Review reviews Only One Thing Can Save Us concluding "A militantly anti-union party now controls Congress. But history shows that the ideas that grow into legislation need an expansive advocacy to fertilize their bloom — which is why Geoghegan’s book is so useful."